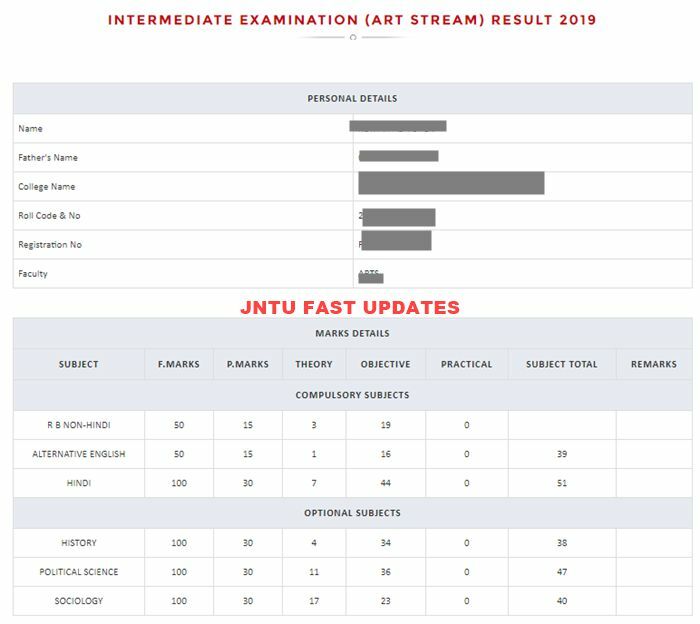 Bihar board Intermediate Result 2019: Bihar Board 12th Result 2019 for Arts, Science, Commerce arts Released at www.bsebinteredu.in, biharboardonline.bihar.gov.in, indiaresults.com. Students can check their bseb 12th result 2019 name wise with marks from official website. There are many aspiring students in the state of Bihar, are waiting for Intermediate Result 2019. These Class 12th board exams are conducted in various streams like Arts, Science and Commerce across the state in various centers. All the students who are getting ready for employment or higher studies like degree or engineering are waiting for the release of intermediate result 2019 bihar board. Bihar Board 12th Result 2019: The BSEB Intermediate Result 2019, the Bihar Board 12th Science Result 2019, Bihar Board 12th Arts Result 2019, Bihar Board 12th Commerce Result 2019 announced on March by the Bihar School Examination Board (BSEB). The Bihar 12th Result is available on the official website biharboardonline.bihar.gov.in. The Bihar Intermediate Board exams 2019 was conducted from 6 February and ended on 16 February for Arts, Science and Commerce streams. Nearly 13 lakh students appeared for the Class 12 exams at 1,339 centres across the state this year. 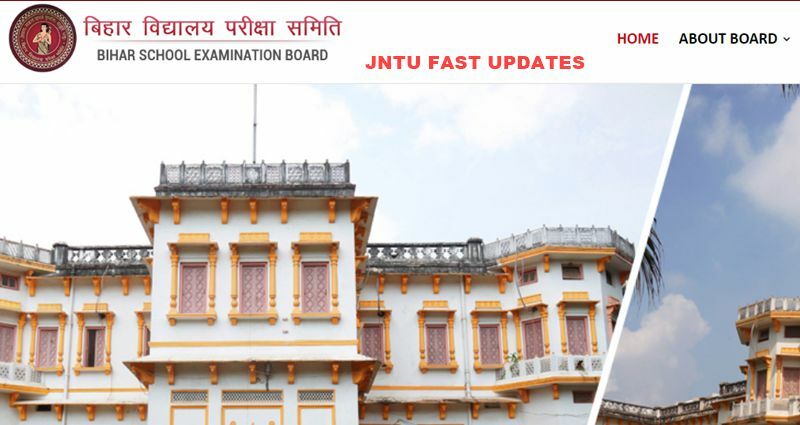 All the candidates can check their Bihar Board Inter result 2019 on these pages as well bihar.indiaresults.com or examresults.net, results.gov.in. There are several ways of checking results these days. We advise students to be in touch with their school as this will help a lot. You may go to the official website and check online too. All students who would like to pursue degree after intermediate in the state of Bihar are advised to visit the official website of the Bihar board. They can download the 12th results 2019 as soon as they are issued. Students can also keep a print copy of the same. The intermediate examination of Bihar School Examination Board (BSEB) will begin from Wednesday, February 6, 2019 at 1339 centres in 38 districts across the state. A total of 13,15,371 candidates have registered for the examination. This year, a record number of 13.15 lakh students will appear for the Intermediate (Class 12) examinations which will be conducted from February 6 to 16, while around 16.5 lakh students will appear for Matric (Class 10) examinations that is commencing from February 21, 2019. The Bihar board 12th Result Announced, after the exams are wrapped up. The results are generally out in the month of March. But this year bseb 12th result announced in the month of March/April. Even though the exact date of results is not yet announced, it is the tentative time. So students who are going to appear for Intermediate Board exams under Bihar Board are advised to wait patiently for the announcement from the board. The board announced the Bihar Intermediate results 2019 through its official web portal. Students are advised to visit the official website to check their results after the released by the board through its web portal. Students can check stream wise results from the official website of the board like bseb 12th result 2019 arts, bseb 12th result 2019 science, bseb 12th result 2019 commerce. The results will be declared either by the educational minister of the state or by the higher authority of the board. The results will be released Name wise via official site of Bihar board i.e., biharboardonline.bihar.gov.in and indiaresults.com. BSEB Intermediate Result 2019 Date and time? The Bihar Board will be officially announces the results for the exams in February 2019, 30 days to 40 days after the last exam. Students those who are waiting for their Bihar Board 12th Result 2019 must keep ready their roll numbers to check their respective results. Click on below link to search result for intermediate Arts, Commerce, Science and Vocational. 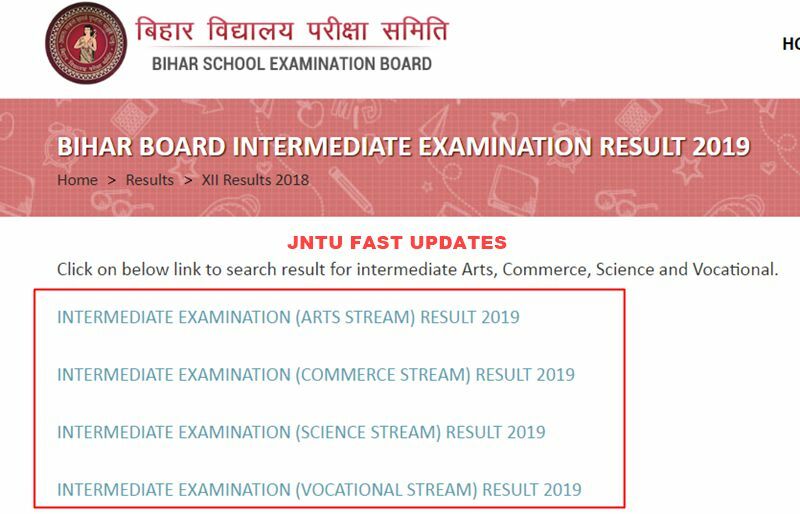 How to Check Bihar Board 12th/Intermediate Arts, Science, Commerce Result 2019? 2. Go to Top Menu, Click on XII Results 2019 link, Under the Results Tab. 3. 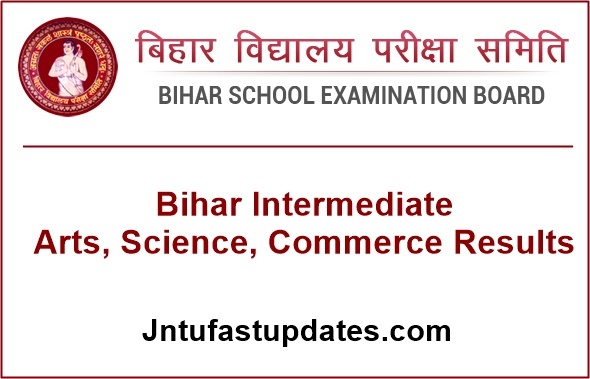 Click on below links to search result for Bihar Intermediate Result 2019 Arts, Commerce, Science and Vocational. 4. Enter your Roll Number, Roll Code Or Search Result by Students Name in the box provided. 5. Click on Search button and your results are ready! Students can also check their Bihar intermediate result 2019 via SMS. Students need to send a SMS through their smart phone or mobile, as below prescribed format. Last year, almost 12,07,986 students had appeared for the Bihar intermediate Class 12th exams. Out of 12 lakh, 6.31 lakh passed the exam taking the overall pass percentage at 35.24. This year, in the Arts stream, 61 per cent have passed, 44 per cent in Science and 91 per cent in Commerce. The toppers will get 1 lakh cash prize with a laptop and a kindle e-reader tab from the government of Bihar. Cash prize of 75000 will be given to second topper and cash prize of 50000 will be given to the third topper with a laptop. The fourth and fifth topper will get 15000 cash prize with a laptop each. 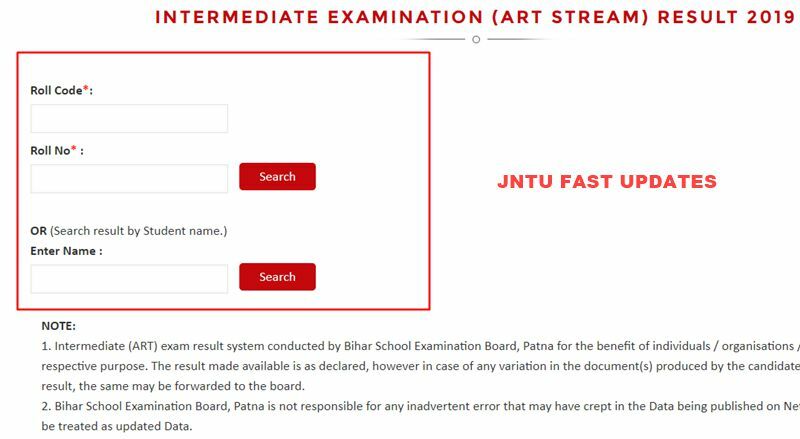 1.3 How to Check Bihar Board 12th/Intermediate Arts, Science, Commerce Result 2019?